Although Thanksgiving left me surfeited on rich food and wanting to eat nothing but brown rice and vegetables for a few days, I convinced myself to get back in the kitchen and make some very rich cookies. These aren’t just any cookies: They’re my family cookie, a special recipe my grandmother brought with her (in her memory) when she and my grandfather fled Nazi Germany in 1940. These are S-cookies: butter, sugar, eggs and flour, along with that magic ingredient, lemon zest, formed and baked into S-shapes, sprinkled with sugar. 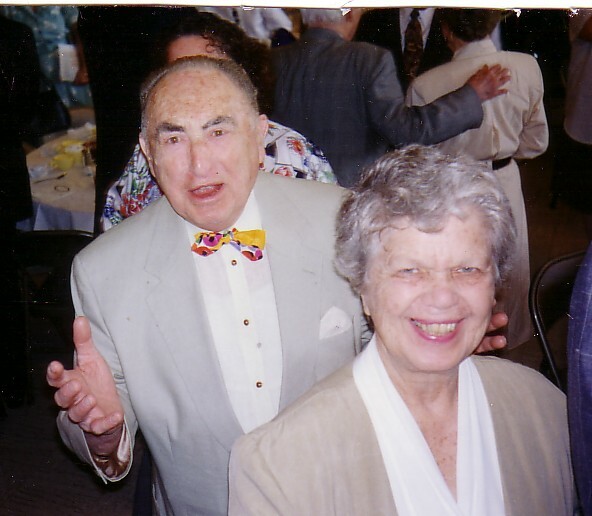 They always seemed especially significant to the Sonneman family, because of the S–though perhaps other families shaped them into different letters. In any case, they’ve always been our cookie for celebration. So why bake them now, just after Thanksgiving? Well, no one loved S-cookies more than my father and for many many years I baked them soon after Thanksgiving so they’d arrive in time for his birthday on December 1. He would hide the tin of cookies I sent him, sneaking them out one-by-one with afternoon coffee or tea so he could savor them like fine cognac. He’d give one to a friend or neighbor only after he’d expounded on the cookies’ specialness, to make sure they appreciated each bite. My father always thought he’d live to be 100, but he died at 93. I still miss him deeply, but I remember well that he never passed up an occasion to celebrate. 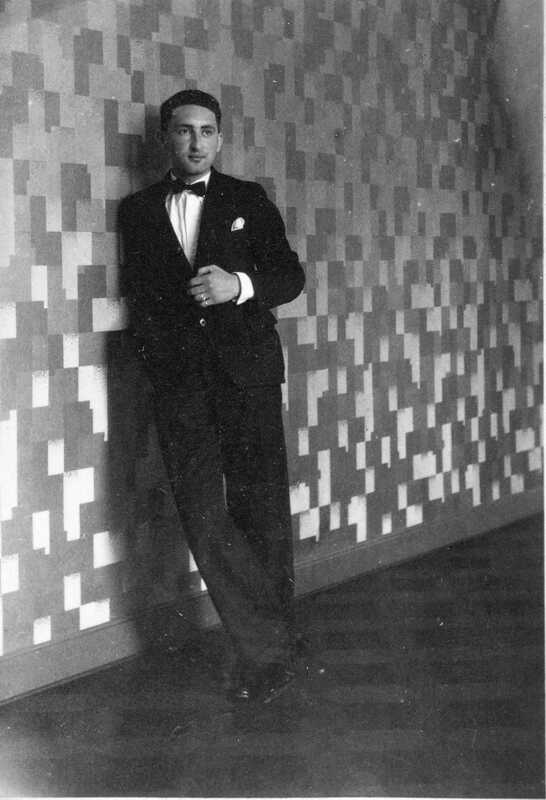 This year, December 1 is the 100th anniversary of my dad’s birth in 1910. 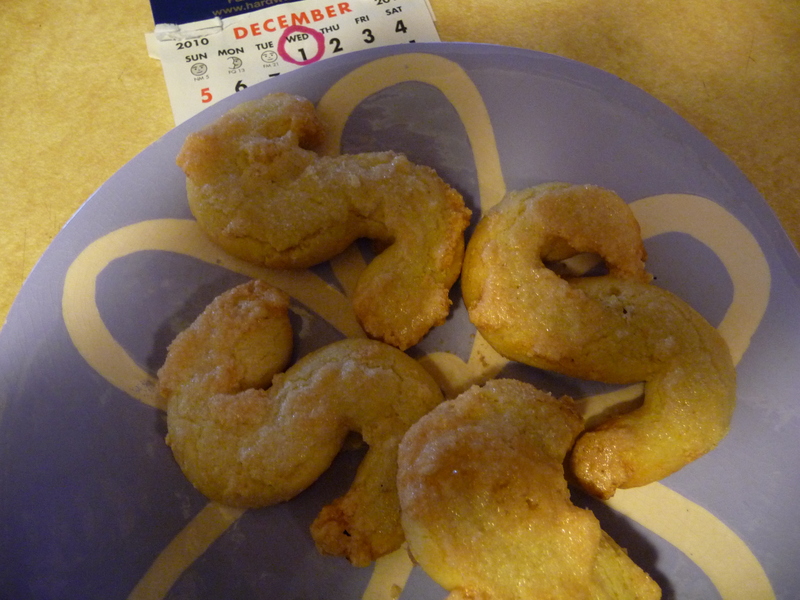 So, even though he’s not here to enjoy them, I just had to make some S-cookies in his honor. I’m absolutely sure he’d want us to be celebrating this day. I made two batches of them and sent them out to my family as well as to our dear neighbors on Bennett Avenue in Chicago. I saved just a few at home so Steve and I could mark the occasion without suffering the consequences! It calls for the zest of one lemon, but my father never thought that was enough, and neither do I. If you are going to go all out and make these rich cookies, buy an extra organic lemon or two and at least double the amount of zest. My mother tried to make these less cholesterol-laden but it can’t be done successfully. If, like me, you need to monitor such things, resign yourself to just eating one…or two, at most. My father thought I should keep the recipe a secret, but it seems to me that every culture, family or cook has their own particular must-have rich treats for special occasions. So even though I share the recipe with you, S-cookies will still and always be my family recipe. For me, that’s special enough. Mix all the ingredients, adding the flour until it forms a soft, but not sticky, dough. 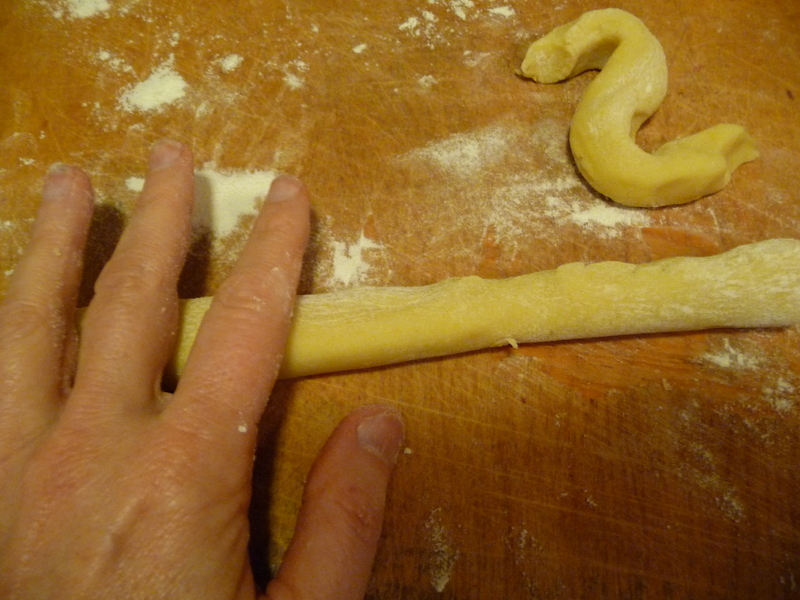 Take about a quarter of the dough at a time and roll into a rope, cut into 2-inch lengths and shape into backward S-shapes (like rounded Z’s). Place the cookies on cookie pans, cover with plastic and put in the refrigerator overnight (or freezer for a few hours). Bake (at 350) for about 15 minutes, or until the cookies are golden brown on the bottom and turning golden on top. Cool on a cooling rack; store in a tin. Dec. 1 is the first night of Chanukah this year–and my dad’s 100th birthday. It calls for some S-cookies! 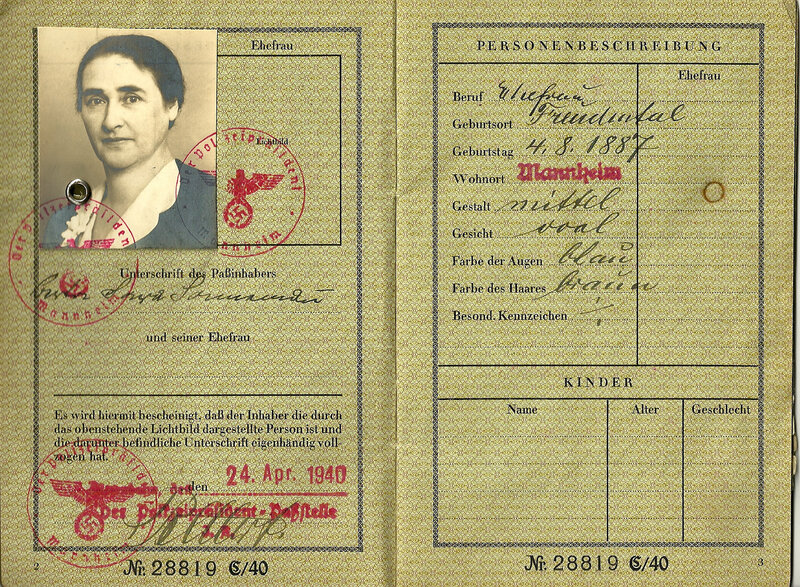 Wow – this really brought tears to my eyes; I especially love that photo of your Grandmother on her passport. I sure see Joe’s face in hers. The photo of your Father is a gorgeous one. Happy Chanukah – and Thank you so much for sharing such a special memory and recipe. I shall make these cookies for the holidays, and think of the Sonneman’s. I relish your blog site. Good morning, Toby. Thank you for the recipe, but more for the family history and wonderful photos. There is a depth of richness throughout your writing. The cookies themselves remind me of an italian recipe I’ve made before called buranelli. I’ll have to check to see the similarities and differences. A lovely tribute to your father! What a wonderful posting! Thank you so much for it. It really hit home because my father loved an old-fashioned sugar cookie of mine, which I would make every year around the holidays, when he would be spending the winter with us in Paris. I am going to make those cookies again this year, despite his death in July, and I think I may have to try your family’s S-cookies as well! I love the photos you use in your blog; they’re pushing me to learn how to illustrate mine of these days…. I just wish I weren’t such a Luddite! Thank you, Paula. How lovely that you have a sugar cookie memory associated with your father too… and that he wore bow ties! If you don’t already know this story you may wish to check out my blog post at http://iowahistory.blogspot.com/2014/09/herbert-hoover-native-iowan.html — a mention of your dad, and a link to this absolutely wonderful connection. Thanks for sharing. Thank you so much, Sharron! That certainly is a great connection. I’ve been to the Hoover Museum a couple times and have watched the video of my dad talking about the Hoover rolls. I love that you came up with a recipe for them! Thanks so much for writing. Hi Toby, Thanks for sharing the wonderful family photos & memories. I was honored to meet your Dad once years ago, and he was vibrant and had a great spirit! And was still wearing bowties! My grandmother’s favorite celebratory cookie was a Muhn (poppyseed) Cookie that was very rich. I haven’t been able to duplicate it. Any help would be appreciated. We think of Joe often, and have a photo of him on our fireplace. He is still loved and missed by all of us who knew him. More Pecan Sandie type richness, than buttery . . .
would love to try your recipe with rye. I agree about lemon zest! I think that texture is achieved by confectioners sugar — makes the cookies tender and crumbly. Aw, this was a wonderful story. I am so glad you shared it. It made me smile and think of my family and grandparents. I also make S cookies every year, for me it is at Christmas time. My Grandmother taught me when I when I was a girl. All four of my grandparents came from Germany in the 1920’s and the recipe came with them. I bake them in honor of them and to carry on the family tradition. Thank you so much for your comment. I love how the S-cookies are so much easier (for me, anyway) than a rolled cookie. Everybody loves this rich cookie — that makes it a nice family tradition to carry on! My great great great grandmother (maternal) brought this S Cookie recipe from Germany and we’ve been making them every year since. Our family recipe uses the egg wash and dust on a mixture of pecans, sugar and cinnamon. Thanks, Amy. What a long history of the cookie! And your variation topping sounds delicious.